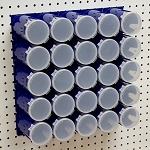 The container is placed in the dock on its side so you can look through the lid to see what you have. 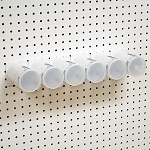 You can also place a label the lid for quick reference. 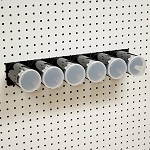 On the pegboard, the dock takes up 3 inches by 3 inches and can be arranged directly adjacent to each other, either vertically or horizontally. 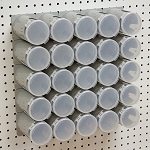 SmartJars® are 100% Made in the USA. 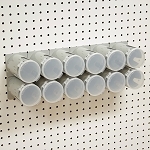 The SmartJar® Dock is designed to snap easily and securely into standard pegboard measuring between 1/8" to 3/16" thick, with 1/4" diameter holes on 1" spacing. 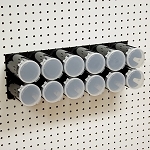 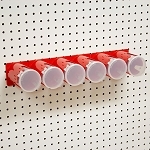 Standard pegboard is widely available on Amazon.com and other large retailers. 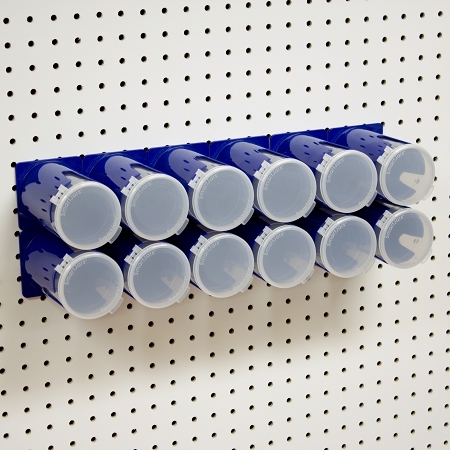 This product is not compatible with thin, metal pegboard or pegboard panels with holes smaller than 1/4". 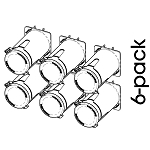 Copyright 2014 SmartJars, Inc. All Rights Reserved.